First, clean the trotters and season them with salt and pepper. Then, put them into the bag with the cinnamon and the bay leaf and cook the mixture in the SmartVide at 80 ºC (176ºF) for 16 hours. Once the trotters are cooked and are good and hot, clean them and lay them on a piece of cling film, making as even a rectangle as possible. Put the foie on top of them and roll them, trying to remove as much air as possible. Let them cool and put them to one side. 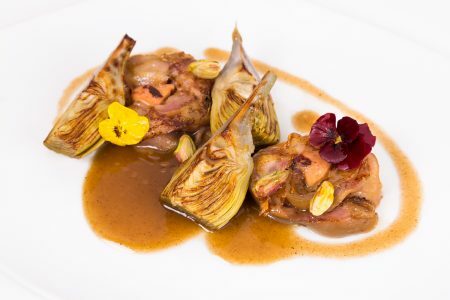 To prepare the artichokes, first of all, remove the hardest leaves and the stalk. Package them with salt and a little oil and cook them in the SmartVide at 85 ºC (185ºF) for 45 minutes. Then, divide them into portions and sear them in a pan. To finish, cut the cold roll of trotters and sear them in the salamander grill. To serve, place everything onto the plate and finish up by drizzling a little of the meat juice over the top. In this recipe, the vacuum will help us to achieve enhanced texture and nuances, both in the artichokes and in the trotters, as we’re cooking them in their own juices.